When it comes to SEO you can always attempt to handle your own efforts. But you should know what it takes to be successful and effectively boost your rankings. Let’s take a look at the real inhouse SEO costs, and whether it’s an effective model for your business. The exact cost of doing your own SEO will depend on your budget, as well as the keywords that you are targeting. It will depend on how many keywords you want to target and how competitive they are. The more keywords you target, the more expensive your SEO campaign will be. Also, if your business is less established online than your competitors, this can also increase the cost of your SEO. Generally, the higher your investment, the better chance you have of achieving higher rankings and attracting visitors to your website. But it’s crucial that you handle your SEO correctly. But it is still good to have a reference point to start with. If you decide to pay for this service, you can expect to pay between £250 and £750 per month. This amounts to around £3000-£900 per year. Whether or not this will give you value of money will depend on a few factors. Your SEO team should not take shortcuts when it comes to optimising your site. That may just cause you to receive penalties – money wasted. If you’re not sure who to use for your SEO campaigns, or if you simply want to save money, you can do it yourself. Apart from the financial investment, it will require time and effort to handle your SEO effectively. That’s one reason why many companies get a marketing team to handle their SEO. The amount of time you spend on your marketing campaigns will depend on your goals and your resources available. If you have qualified personnel who can work on this, you can use their time and effort to handle your in-house SEO. You can significantly reduce the cost of SEO by doing this in-house. For example, the small business targeting around five competitive keywords can expect to pay between £100 and £2500 per year. In the years after that, this will drop to around £1200 for your ongoing effort. You don’t have to go on an extensive course to learn how to effectively handle your own SEO. There are plenty of resources online, as well as expert advice and forums. If you have a small business and you want new to SEO, you can learn the basics of SEO from a few reputable sources. This will give you everything you need to start your own effectively SEO campaign. You don’t necessarily have to be an expert to be able to upgrade your competitors within search results. It’s all about having the right combination of keywords, optimised content and relevant links. You should start by doing comprehensive keyword research. You can do this by using one of many reputable tools, like Google’s Keyword Tool. This will give you a very good starting points in terms of choosing the right list of keywords target for your business. If you want to effectively search your top competitors and who is linking to them, you should use a tool like Ahrefs.com, which costs around £50 per month. You don’t need to use it every month though, just the first month and then, perhaps every three months or so, to freshen up your data. Another reason why businesses choose to have their own online marketing is the speed of the results. If you handle your SEO in-house, your team will likely be able to work on this project faster, as they don’t have to handle marketing for multiple clients. Some agencies are paid based on the time they spent on the project. This can potentially make expensive for someone else to handle. However, if you have the budget for this and really want the best results, you can consider hiring a reputable SEO firm to handle your marketing. Your in-house marketing team will likely care more about your marketing efforts than someone on the outside. Someone has to take responsibility for your SEO efforts, which is why the in-house team is often the way to go. It’s also a great idea to permanently develop your marketing team’s SEO skills. This can be quite handy going forward, as they can handle all your marketing efforts in-house. Next, you should focus on optimising your website content. Try to have an individual page for each of your products or services. You should have between five and 15 pages of authority conflict to help your website attract backlinks from reputable sources. Also, make sure that you update this content. At least once a month. If possible, try to use professional content writers who know how to optimise website content for your specific business or industry. Ideally, you should not have to buy any backlinks to your website. Plus, it against Google’s guidelines. The only real negative about doing your own in-house SEO is using your own time and resources. If money is not an issue for your business, you can by all means hire an expert to handle this on your behalf, while you focus on other aspects of your business. SEO is essential for every online business, regardless of how you handle it. With successful content being so important for SEO, working with an SEO expert is essential. 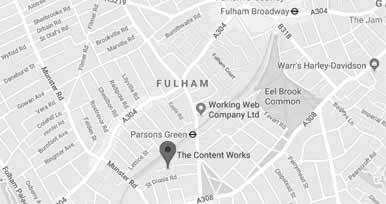 The Content Works provides valuable, optimised content for your unique SEO needs.